The Alliance for Sustainable & Holistic Agriculture, a loose network of individuals and organizations who believe that sustainable agriculture is the only way forward are calling for a Kisan Swaraj Yatra (literally, Farmers Freedom Journey) from Sabarmati in Gujarat all the way to Rajghat in Delhi. The Yatra is an outreach effort across India towards self-reliant, ecological farming and for securing farming communities’ rights and will commence on October 2, 2010 on Gandhi Jayanthi from Sabarmati and will conclude in Delhi on December 11, 2010. It will cover the states of Gujarat, Madhya Pradesh, Maharashtra, Goa, Karnataka, Kerala, Tamil Nadu, Pondicherry, Andhra Pradesh, Orissa, Chattisgarh, West Bengal, Jharkhand, Bihar, Uttar Pradesh, Uttarakhand, Himachal Pradesh, Punjab, Rajasthan and Haryana. Jal, Jangal, Zameen aur BEEJ (Water, Forest, Land & SEED) – the basic common resources that have always belonged to people who acted as the resource-savers and resource-keepers – are in great jeopardy today. These are the basic resources which are pre-requisites for the sustainable livelihoods of millions of Indians. Along with these resources, the very lives of our fellow citizens are perched precariously, mired in unconscionable poverty, hunger, lack of basic rights and any assertive power. The Swaraj Yatra seeks to remind all Indians about our hard-won independence and the insidious manner in which neo-colonial powers in the form of big agri-business MNCs, often times hidden behind their Indian avatars including public sector institutions and behind huge charitable organisations, are threatening such independence. Set on its mission of “Swaraj”, the Yatra will have exhibitions, seed diversity and organic food festivals, public meetings, rallies, film screenings, cycle yatras, street plays, direct actions, lobbying meetings, press conferences and ‘skillshares’ along the way. The Alliance feels it as a matter of shame that in a country where nearly 70% of the population is still connected with farming and food production, rural hunger and starvation is so high. 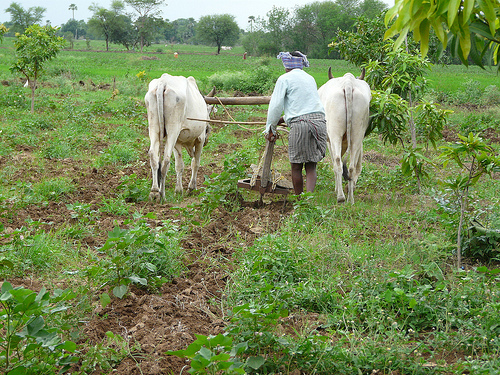 At the same time, increasing corporatisation of basic resources through pro-industry, anti-farmer policies, regulatory frameworks and by conferring legal rights to industry in the form of exclusive rights like IPRs over life forms, the government is violating the apriori rights of our farmers over resources like Seed. The people who are producing food to feed the nation are committing suicides in lakhs and are demoralized with their self-respect being eroded constantly, while the industry and sections of the government are gloating about the business opportunities presented by agriculture in India! Kisan Swaraj Yatra sets out to with a focus on telling the truth based on the philosophy of “Satyameva Jayate”. The truth about the macro-agricultural policies, the truth about technologies like GM seeds and the situation in India at present, the truth about MNCs like Monsanto, the truth about the public sector institutions that we are supporting with our tax money, the truth about other unsustainable technologies like synthetic pesticides, the truth about corporate and contract farming and most importantly, the truth about ecological farming as the only way forward. The Yatra will also highlight the fact that in this age of appropriation of people’s natural resources for corporate greed, the only way to attain sustainable development for all is to stop such an appropriation. Bt Brinjal, the first GM food crop sought to be introduced in India has been stopped on its juggernaut towards our dinner plates for now. However, the initial regulatory approval and the opposition to the moratorium decision after February 9th 2010 actually showed the nation and the world how the pro-GM lobby will go to any extent to bypass citizens’ democratic voices and ram these unwanted technologies down our throats. There were even official proposals of imprisoning GM critics through a new statutory regime in the form of the Biotechnology Regulatory Authority of India (BRAI) in addition to wanting to curb the constitutional authority of state governments which are increasingly asserting their right to remain GM-Free, under pressure from people. On another front, the movement of ecological farming, to reduce the risks of small and marginal farmers of the country, to shift them to greater food security and sovereignty and to make farming viable for them again, is gaining strength in various states across the country. Come be a part of the rally, and join in to protect the rights and life of the very farmers who work hard for growing our food. Click here to Download the exact route and events during the Yatra, along with the contact person(s)’ info. Jai Kisaan! The kisan yatra is a alliance of honest groups working for poor and needy farmers. Isupport the cause.